Shaving creams are without doubt the most popular men's grooming products that seem to be appearing left, right and centre on the market. If you're an avid reader of this blog then you'll probably be aware of the fact I do love a good shave cream, but if truth be told, a decent shave cream is pretty few and far between. 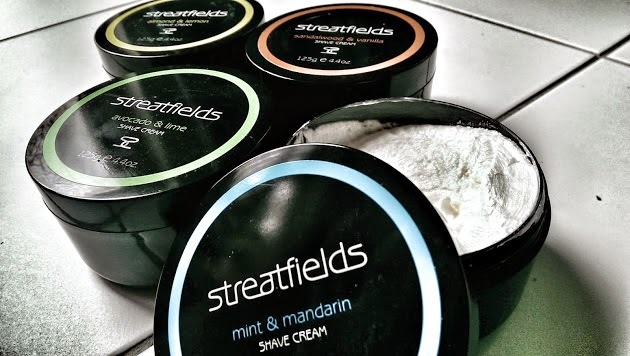 "Our shave cream helps give men the closest, smoothest, softest shave possible"
At Streatfields Skincare our shave cream is made slowly and with great attention to every stage of its manufacture, not rushed or hurried, never cutting corners. Without being pretentious like a fine wine. Although it’s an old very traditional recipe, it’s been refined by us over time without compromise on quality using only the finest of ingredients and never dropping standards whilst bringing it into the current century. In use, it moisturises the skin, helps prevent shaving rash and ingrowing hairs and the amount needed is considerably less than most brands. Less is more is its byword. So this being so then ml by ml it stands up against the cheaper brands. If you're like me in the sense that you prefer a shaving or skin care formula that treads along the zesty/fruity scent then you'll absolutely love Streatfields. Each and every formula is unique and smells incredibly divine, without the overpowering scent that you would usually associate with fruity formulas. I just love the way Streatfields have creatively combined scents such as avocado with lime and the even more unconventional combination of sandalwood and vanilla. On paper these combinations would seem like a recipe for disaster, but on trying them out I was extremely impressed by how well they blended and worked, helping me achieve a refreshing shave and remaining subtly scented throughout the day. The texture of these creams are perfectly formulated, just how a shave cream should be, with a medium thickness and a soft, fluffy feel. These creams form an excellent lather and the containers are ideally suited for those of you who prefer to lather up with a shaving brush. Overall, Streatfields is an excellent, affordable brand and a must buy for all you shaving gurus. For more information and news on this superb brand, visit Streatfields today.